Mardi Gras Around the World Series – Carnaval de Nice, France!! I’ve been to a major music publishing trade show at the Palais de Festivals in Cannes, France a number of times. Same place as the Cannes Film Festival. The show occurs in January, and more than once we came to France around Mardi Gras time. Nice and Cannes are very close together, both are on the Riviera aka the Mediterranean, they are next door neighbors. So I’ve been to Mardi Gras in Nice a couple of times, and had a very nice and somewhat wild time. 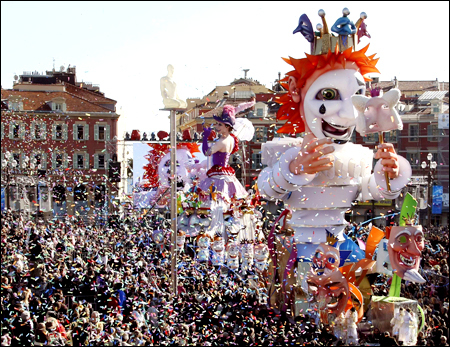 Nice’s Carnaval, which dates back to 1294 and is today the largest in France, includes many iconic trappings of a Mardi Gras celebration. Parades of floats topped with papier-mâché “big heads” make their way down the Place Masséna (the procession is illuminated at night); street performers add to the entertainment; and for the finale, an effigy of King Carnaval is burned and fireworks light up the sky. But the centerpiece of the annual fête is the Flower Battle. A tradition of exchanging bouquets and decorating carriages in the 19th century grew into a gorgeous parade of blossom-bedecked floats. Until the 18th century, Carnival was punctuated by masked balls and frenzied farandoles (dancers) in the streets of what is now Old Nice. During the major political and military upheavals caused by the French Revolution and the First Napoleonic Empire, Carnival festivities were suspended. In 1830, a first cortège was organized in honour of King Charles-Felix and Queen Marie-Christine, rulers of Piedmont-Sardinia. Some thirty carriages paraded in front of the monarchs, announcing the future form of Carnival. Any excesses were soon controlled by the “Abbés des Fous” (Fools’ abbots), entrusted by the clergy with supervising the people’s revelry. In 1873, Nice began using decorative staging, float processions and stands for the spectators. It was then that Nice Carnival entered the modern era. Since 2005, the decorations have synced up with each year’s Carnaval theme (the King of Sport theme for 2012 is in honor of the upcoming London Olympics). Instead of beads, costumed revelers riding the floats toss up to 100,000 flowers into the crowd. Even ganses, a Niçoise variation on fried dough (similar to beignets and bugnes), get a festive flourish of orange flower water.